Vegan Baking Tip: If you're cooking or baking with nuts and they're going to be under heat for less than 15 minutes in the final recipe, toast them before adding them to the recipe for maximum flavor. To do this, heat your oven to 350˚F (177˚C) place your nuts on a baking sheet and bake them for 10 to 15 minutes or until they're golden. 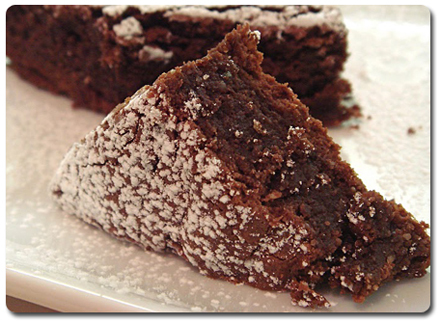 Perfect for any occasion, this rich and chocolaty torte is dense, decadent and deliciously vegan. Grease the inside of an 8 or 9 (20-23cm) inch springform pan and dust lightly with one tablespoon cocoa powder, remove excess by tapping it out. Melt the chocolate and margarine in a double boiler, stirring to combine. Allow to cool 2 to 3 minutes. Place almonds and sugar in a food processor and pulse until the almonds are finely ground. Pour into a mixing bowl. Add tofu, soymilk, cocoa powder, egg replacer, vanilla, almond extract and salt to the food processor. Pulse until smooth. Whisk together the tofu mixture with the almond and sugar mixture. Then stir in the melted chocolate. Pour batter into springform pan, tapping the pan gently on the countertop to remove any air bubbles. Roll prepared crust loosely over rolling pin to transfer to the pan. Position rolling pin over the center of the pie pan and unroll, gently easing crust onto the pan. Gently press crust into the pan and trim the edges of the crust. Bake for between 30- 40 minutes, until the top of the torte is slightly cracked and the torte is set. Allow to cool, cover with plastic wrap or foil, and refrigerate 2 hours before serving. Dust with powdered sugar, or best served with vegan whipped cream or vegan ice cream.